To give people the tools on how to grow and evolve to their highest possible level of human potential and become true mentors and partners in the Universe, and to fulfill one’s highest purpose and power of intent as a catalyst for consciousness evolution. To gain the ability to really be exorbitantly happy and for each soul to evolve to full consciousness in this life. To create a social structure of pure exchange by assisting each other to open up and contribute to the Universe; whatever it may be. The Foundation for Human Kindness and Compassion is a non-profit focused on improving one’s self and giving the tools on how to grow and evolve to their highest possible level of human potential and become true mentors and partners in the Universe. The Foundation for Human Kindness and Compassion is first and foremost a transpersonal educational program and spiritual change for individuals. The Foundation was established on 09/02/2015. 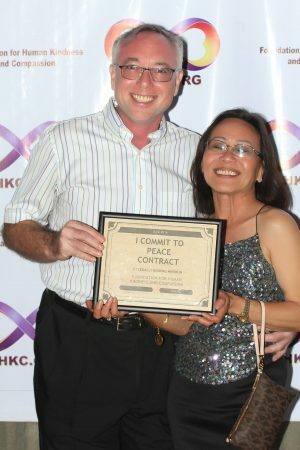 The Foundation for Human Kindness and Compassion is an incorporated non-profit founded by husband and wife team, Richard Eckhouse and Desiree Pascale-Eckhouse, and has a board of three directors. The Foundation for Human Kindness and Compassion is focused on self and spiritual improvement. Through workshops seminars and one-on-one mentoring, the Foundation works to achieve this goal. The Foundation for Human Kindness and Compassion will provide training and one-on-one mentoring in 30, 45, or 60 minute sessions. A series of small group advanced workshops running as full day sessions will also be provided. Content for these workshops will be developed through a combination of mentor and student consultation as well as research conducted by the Founders. The pragmatic approach delivered by the Founders and motivational guests speakers provides and proves to engage both students and mentors. Aside from being a mentoring center, the Foundation for Human Kindness and Compassion also have different projects in helping people based on our sole purposes. One of these is helping people who are close to being homeless. Many people are so close to being homeless these days that to be given “a small push” is as a requirement for success in them entering the job market, making preparation for a sustainable stability success critical. With the Foundation being passionate about self-learning, we will also establish educational campaigns for Third World Countries children in public schools in the future. FHKC is a hands-on movement that recognizes that every individual deserves to enjoy a healthy self and life. We take an innovative, straight and very down-to-earth approach in making our projects a success. As FHKC members, we are trying to make a positive difference through our actions. We have begun a project to provide those less fortunate an opportunity for a better life thus, better selves. The Foundation for Human Kindness and Compassion at the moment will focus their ACCESS Angels’ fund raising events in the Gaslamp area of San Diego. We envisage that our programs will not only provide a network of services for one’s individual positive and spiritual change but will also allow us to achieve this mission, leading to positive, lasting change – and creating better lives for those we serve, their families, and the community as a whole.